In 2009 I was compulsorily detained under the Mental Health Act in an acute psychiatric ward in North Manchester Hospital. I absconded twice within a week during my first month there – fairly soon after my admission – even though I was supposedly on close 1:1 observation, especially at night. This was because I was acutely suicidal when I was first admitted, and that was the reason for my sectioning. Thinking back on the experience of 1:1 observation, I remember a quite imposing big woman sitting outside my single room for the entire night. She was constantly flicking through a magazine, and her job was only to prevent me from leaving my room. She would not engage with me in any other way. Nobody introduced her to me or explained her role. In her act of watching me I did not experience any care or concern whatsoever for me and my distress. I guess I experienced her as a prison officer or a security guard. My bedroom was supposed to be my private space, and being watched by a complete stranger in such close proximity for the entire night felt quite exposing, threatening, intrusive and oppressive. This was bound to exacerbate the already heightened vulnerability and acute lack of a sense of security that my suicidal feelings had left with me. Reflecting on this experience, I can relate to the idea of observation as a ‘custodial ritual’ rather than any kind of meaningful and ‘purposeful engagement’ (as discussed in the article above). Very early on I sensed the complete lack of therapeutic care during my detention on the ward. Staff rarely engaged meaningfully and therapeutically with the patients, if at all. Their interactions with the patients occurred mainly during the administration of medication – and the odd bingo night! When they were not administering medication, I remember the staff mainly sitting in the nurses’ office and talking, eating and drinking coffee, or looking at a computer. It appears from my case records that I was very agitated, acutely distressed and constantly knocking on the nurses’ office door to tell the staff that I wanted to go home or that I wanted to go to the vending machine outside the ward. Apparently, the staff perceived me as ‘intrusive’: it seems that my acute distress and agitation was construed as an irritating, childish kind of intrusion by the people supposedly responsible for alleviating and containing my distress. As a result, I was sent to my room – ‘to have a time out’ – or, in a few instances, I was physically restrained. I now wonder whether the absence of staff’s meaningful engagement with the patients was – at least partly – due to the staff’s inability to tolerate acute mental distress, and their consequent need to defensively detach themselves from it. Nobody had explained to me what was meant by ‘sectioning’, or how long my sections were likely to last. By trial and error I just figured out that I could not even go to the hospital grounds without permission. I felt disorientated, powerless, endangered and terrified, to the extent that I became incontinent. That was the environment which I was desperate to abscond from. Even though I was on close observation, heavily medicated, very distressed and so disorientated that I did not really know where the hospital was in relation to familiar areas of Manchester, I still managed to abscond. The hospital was in North Manchester, and at the time I lived in South Manchester – almost two hours away by public transport. I don’t remember what happened the first time I absconded but apparently I managed to get the bus from the hospital to the city centre, and then to get home! The second time was at night and I remember it: quite late, I got into a taxi, paid £10 and was taken home. Both times anything could have happened to me – I could have been run over by a car or I could have killed myself. As far as I can remember, nobody on the ward asked me about my suicidal feelings, in any meaningful or therapeutic way: why had I wanted to take my life, what exactly I was feeling and thinking? I guess I was just asked whether I wanted to harm myself and a box was ticked. I wouldn’t call this ‘competent and meaningful risk assessment’. On reflection, I find the distinction between ‘environmental/ physical security’ and ‘relational security’ on psychiatric wards really helpful.1 Measures currently used to enhance environmental or physical security in mental health wards include constructed features (e.g. fenced garden areas), alarm systems, formal observation systems (e.g. CCTV monitoring, scheduled staff observations), swipe-card systems for controlled access to wards, or locking wards. Using the threat of compulsory detention for voluntary patients if they attempt to leave the hospital, or withholding patients’ leave are also measures used allegedly ‘to keep patients safe’. However, genuine safety and security in mental health wards cannot be achieved merely through interventions targeting the dimension of physical or environmental security. An essential dimension of safety or security in mental health wards concerns relational security, which can create a sense of attachment and connection for staff and patients alike. It is also thought to be improved by staff being appropriately trained and aware of individual patients’ histories and areas of vulnerability and risk, as well as involving patients in planning their own care. I felt that this kind of relational security was totally absent from the ward I was detained on. I experienced a formal observation system established to enhance ‘physical/ environmental (i.e. external) security’ on the ward but paradoxically this operated at the expense of my internal page 30 asylum summer 2012 security. I think this explains my profound experience of a lack of genuine safety and security on that ward, as well as my consequent absconding. Physical/environmental security provisions cannot substitute for relational security. If there is more focus on increasing physical security and less on developing relational care and security in mental health wards, this is likely to lead to more compulsion, coercion and oppression. In turn, intensifying coercion is bound to undermine patients’ senses of internal safety or security, and may well lead to higher rates of absconding, with all its associated dangers, as my story illustrates. 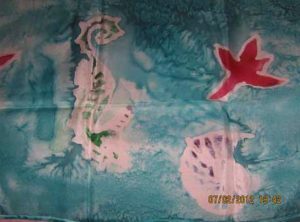 Some silk scarves I painted during Occupational Therapy art sessions when I was detained in hospital in 2009. The two hours of Occupational Therapy per week was the only meaningful activity on offer. OT was an oasis of creativity amidst the soul-destroying dullness of the acute ward. 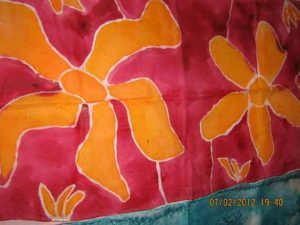 I remember feeling proud of myself for painting the scarves. I guess I was amazed I had managed to be so creative whilst being so severely depressed and demoralised, and on really heavy medication. I guess the art I was engaging in during those sessions reminded me of the possibility of another life, a life of freedom and joy away from the hospital where I was deprived of my liberty. 2. 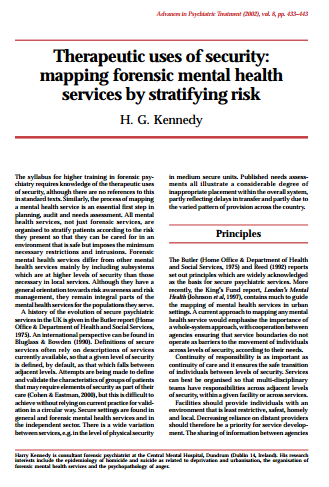 Department of Health (2010) Your guide to relational security – SEE, THINK, ACT.